Murrey and Blue: New Livery Colors for a New Regime? Did the House of York, founded by Edmund of Langley, first duke of York, have distinctive livery colors? Perhaps this is an unusual question to ask, because I’ve always been under the impression that those colors were murrey and blue. In their text Heraldry, published in 1993, Rouge Croix Pursuivant Henry Bedingfeld and Lancaster Herald Peter Gwynn-Jones, both of the Royal College of Arms, write that blue and murrey were the livery colours of the house of York. 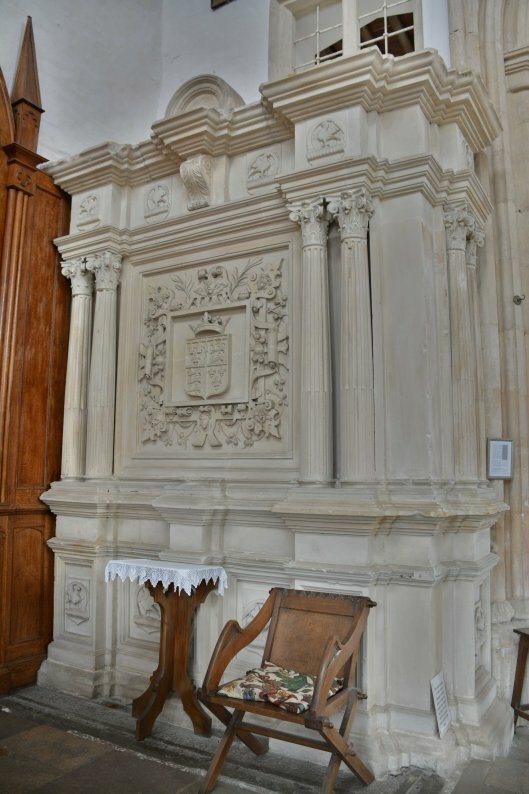 They support this statement with illustrations of the arms granted to Isabella Mylberry, illegitimate daughter of Edward IV and those of her husband, John Awdeley. The battle standard of Richard, duke of Gloucester, also shows the blue and murrey livery colors along with his well-known personal device of the blanc sanglier. Now, this is very curious, given that the same text by Fox-Davies states that blue and white were the livery colors associated with the House of Lancaster, beginning with John of Gaunt, his son Henry of Bolingbroke (later Henry IV) and his grandson Henry of Monmouth (later Henry V). Blue and white are also the colors of the bordure surrounding the arms of the illegimate children of Gaunt, later legitimized, and given the family surname Beaufort. So why would Richard, third duke of York, employ the well-known livery colors of the very House he was attempting to displace from the throne in 1459-1460? Richard held the title of Lieutenant of Ireland, a position he acquired in the late 1440s. In effect, he was King Henry’s top deputy there, and would have been acting on the king’s behalf. (Kings of England at this time held the title Lord of Ireland.) The banner of the Lord of Ireland consisted of three gold crowns on a blue field with a white border. Richard could have used the king’s livery while he was in Ireland, as he was giving service to Henry VI while employed in that role. That could explain the blue and white colors. Perhaps the chronicler mistook the crowns for fetterlocks – this wouldn’t be the first or last time someone would confuse a device; see, e.g., the Battle of Barnet when soldiers mistook Oxford’s streaming mullet device for Edward’s sun in splendor. Duke Richard found himself in Ireland in 1459 following the Yorkist disaster at Ludford Bridge, when troops from Calais abandoned his cause, leaving the duke and his family defenseless against the assembled Lancastrians. There was not much time to prepare for this expedition, as they were facing assured defeat. So the duke fled to Ireland, where he still held the Lieutenancy and was a popular leader, while his eldest son Edward fled to Calais (along with the earls of Warwick and Salisbury) and his wife and younger sons were taken into protective custody. It would seem unlikely that he had given any thought at this time of hauling his own personal livery over to Ireland under such duress; moreover, his retainers in Ireland would already have their standard uniforms. 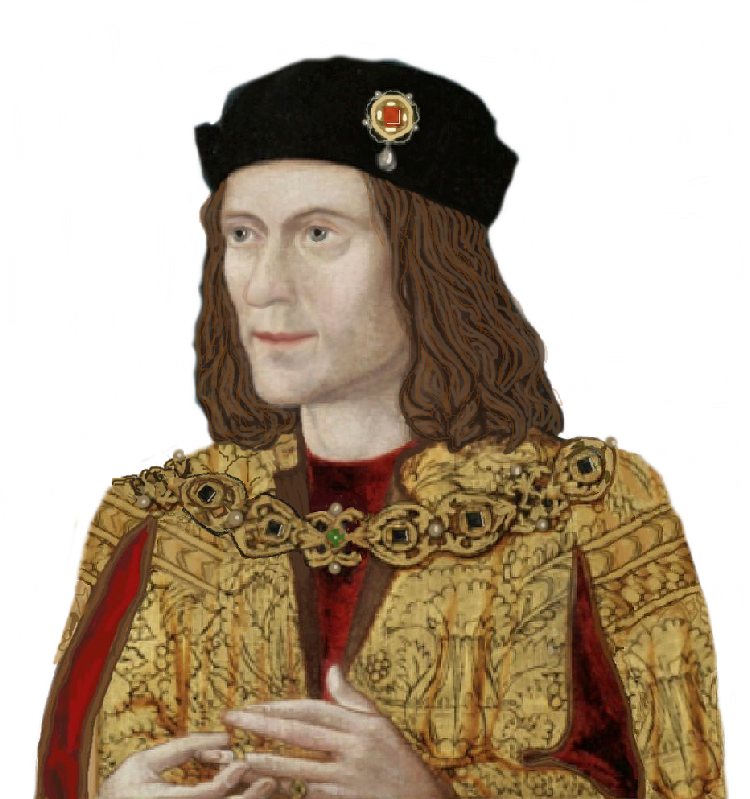 Perhaps when duke Richard embarked for England later in 1459 and landed in Redcliffe, Cheshire, what the Gregory chronicler observed was a modified livery adopted by the Yorkist leader. Certainly, by this time, Richard was displaying the undifferenced royal arms of England, and calling himself the rightful king of England. The incorporation of fetterlocks (a well-known and established Yorkist device) into the blue and white livery would add further symbolism to underscore his claim. Looking further into the use of murrey and blue livery, I noticed that there is a paucity of evidence to support its use prior to the reign of Edward IV. Although the Royal heralds quoted above make the blanket assertion that it was the “Yorkist livery”, all they point to are the arms of Edward IV’s illegitimate daughter. So, perhaps the murrey and blue livery was a creation of Edward IV, to distinguish himself from his Lancastrian predecessors. It does rather fit in with what we know about the personalities of father and son. The father, duke Richard, was part of the “old guard” and a reluctant rebel, at best – at least until the very last months of his life. Perhaps he viewed his service to King Henry as required by chivalric traditions, and used the king’s livery colors for practically his entire life. His son, Edward, grew up in a different environment, when loyalties were already quite tattered and frayed. The murrey and blue livery would symbolize a Yorkist house with distinctive symbolism divorced from the Lancastrians. In other words, the murrey and blue were new livery colors for a new regime.